Headlines claimed that Americans want Romney back. But despite a recent poll touting his comeback, more evidence is needed to show that even Republicans want their losing nominee from 2012 back. Nearly a month ago, a poll showed that New Hampshire GOP voters gave Romney the nod in picking who they wanted to win in 2016. So what did Iowans think? Those who want Romney back crowed that a new USA Today/Suffolk poll of 206 Iowans found that 72 (35 percent) of them preferred the one-term Massachusetts Governor. If you are wondering whether this is a pretty small sample size, you might be right. 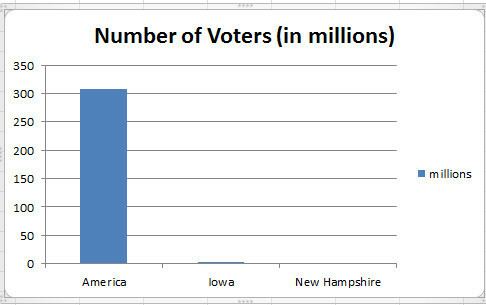 But consider how small Iowa and New Hampshire are to the rest of America. Combined, they make up less than five million residents of a country of 308 million, or about 1.4 percent of the population. Supporters of Romney wrote to defend him, finding his support in states that vote early to be a pretty significant finding. Actually, it's no accident that Romney might be doing better in these two states. He carpet-bombed both with his campaigns in 2008 and 2012 showering both states with ads, signs and money. And he's still doing that, stumping heavily for candidates in Iowa and New Hampshire, like Scott Brown who is seeking a New Hampshire Senate seat. Earlier this month, I wrote about how Mitt Romney isn't being included in nationwide polls; the undecided vote among candidates is pretty small. His supporters can be cheered that the number of GOP undecided grew to 23 percent in a Marist/McClatchy survey, but that assumes all those who can't make up their mind want Romney again. Romney's not a terrible candidate, but he's rapidly approaching Harold Stassen status. For those who don't know, the Republican Minnesota Governor Stassen ran a decent campaign and almost won the presidential nomination back in the 1940s. But then he ran every four years, again and again until it became a running joke. Romney has lost a statewide race for the U.S. Senate (1994), won a gubernatorial race in 2002, lost a presidential nomination battle in 2008, and lost a presidential election in 2012. He's only served in office for four years. In other words, he's spent more time campaigning than governing (one four-year term), not counting his stumping this year. The best way to resolve this debate is include Mitt Romney in all nationwide polls, to see how he'd stack up against Rand Paul, Ted Cruz, Mike Huckabee, Chris Christie, Paul Ryan, Scott Walker, Jeb Bush, and Bobby Jindal. Only then will we know if his support is limited to states he's spent time in.